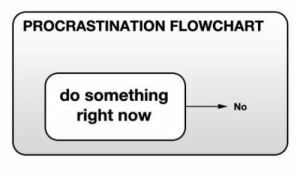 So here I sit, piddling around, looking at e mails, wasting time, avoiding writing the next blog post, which is on procrastination- in other words, procrastinating- when this procrastination post pops up in my e mail. In case you missed it, I put the link below. I also note that I’m still collecting blog posts on how to market, rather than marketing, which is hard work. And I’m collecting tips on publishing, instead of writing the next book. Fish or cut bait. The tip for breaking procrastination – break it into very small steps, pick one and do it. Right now. This entry was posted in add, ADD problems or symptoms, ADD strategies, dysfunctions, procrstination, strategies and tagged ADD, ADHD, adult add, adult adhd, attention, deficit, managing ADD, managing ADHD, procrastination. Bookmark the permalink. I really didn’t appreciate this post because I am at this moment procrastinating. I need to go fold the laundry and start dinner and work on tomorrow’s blog post but instead I’m surfing the net and catching up on your blog posts. But I’m caught up now so I guess I’ll go tackle one thing – the laundry. That’ll probably get me rolling to do the rest.